So as a follow up to a recent post about intra-abdominal thrombolysis, here is a little pearl from a colleague and fellow ICU physician, Dr. Ian Ajmo. The Ajmo sign refers to the visualization of injected contrast in a fluid cavity, used to confirm proper position of a drainage catheter in an effusion or ascites. In the case of a separated effusion, it is often difficult to determine if the septations are truly divisive of the fluid, or just a network of membranes that remain communication and that a single catheter can drain. I have seen both cases with similar echo graphic appearance. In this case, we can see that the agitated saline fills only one of the cavities with little or no spillover into adjacent pockets of pleural fluid. This is a case where thrombolytics can be considered. Hence, this consideration can be done early using bedside ultrasound, rather than follow up CT scans (notoriously poor at seeing fine separations). Ok, so it was pretty cool to see an NEJM issue basically dedicated to septic shock management, I must admit. But let’s dig a little deeper, shall we? So here is where they are: http://www.nejm.org, and fully available for now. a. the N=1 principle – how was therapy individualized? b. was there any integrated monitoring of the therapeutic goals? …and we’ll conclude by looking at the potential practice-changing potential of each of these studies. High vs Low BP Target in Septic Shock, by Asfar et al. So basically a negative study except for two findings, the increased incidence of afib in the high target group and the decreased need for renal replacement therapy among chronic hypertensives in the high target group. So the atrial fibrillation makes total sense – more B agonism should result in that, and the decreased renal failure also does. As the authors note, the actual BP averages were higher than planned. For those of us practicing critical care, we know most nurses titrating prefer having a little bit of extra BP – even when I prescribe MAP 65, I usually see the 70 or so unless I make a point to tell them. Understandable. They also note the underpowered-ness of their own study, but I think it is still worth looking at their results. So…bottom line? I think it’s a great study for a couple of reasons. The first is to remind us to pay a little more N=1 attention to the chronic hypertensives, and that it is probably worth aiming for slightly higher MAPs. The second, debunking the myth of “levophed, leave’em dead” (which I heard throughout residency at McGill), and the concept of doing everything (ie juicing patient into a michelin man) in order to avoid the “dreaded and dangerous” vasopressors. So really I think an alternative way to conclude this study is that it isn’t harmful to have higher doses of vasopressors. I think this is actually a really good study on which to base assessment of more aggressive vasopressor support vs fluid resuscitation, in the right patients. So basically showed no difference, so pretty much a solid italian remake of the SAFE study in a sense, confirming that albumin is indeed safe overall, and may be better in those with shock. As the authors note, mortality was low, organ failure was low, so study power a little low as well. Note the mean lactates in the 2’s at baseline. The albumin levels of the crytalloid only gorup were also not that low, low to mid 20’s, whereas I often see 15-20 range in my patients, especially if I inherit them after a few days, as I do use albumin myself a fair bit. They also used a target albumin level, not albumin as a resuscitation fluid purely. In my mind the benefit of albumin would be greatest in those with significant capillary leak, particularly those with intra-abdominal and pulmonary pathology. It would have been nice to see a subgroup analysis where extravascular lung water was looked at (especially coming from a Gattinoni crew!). Another interesting thing would have been to know the infusion time of the albumin, since animal data tells us that a 3hr infusion decreases extravasation and improves vascular filling vs shorter infusion times. I routinely insist on 3hr infusion per unit, which sometimes results in 9-12hr infusions, almost albumin drips! I like it. Reinforces that albumin is safe, so makes me even more comfortable in using it in the patients where my N=1 analysis tells me to be wary of third-spacing. Also the fact that they used 20% – in Canada we have 100cc bottles of 25% for the most part – is nice, since the SAFE data used 4%. A Randomized Trial of Protocol-Based Care for Early Septic Shock – The ProCESS Trial. So right off that bat my allergy to protocols flares up, so I’ll try to remain impartial. It just goes against the N=1 principle. The absolutely awesome thing about protocols is that it primes the team/system to react – so clearly protocols are better than no-protocol-at-all, but strict adherence would clearly not fit everyone, so that some built-in flexibility should be present. This being said, the ProCESS study is really interesting, for a number of reasons. They have three groups, and compare basically (1) Rivers’ EGDT to (2) their own protocol (see the S2 appendix online) which gives a little more flexibility and (3) “usual care”. Net result is that all are pretty equal, no change in mortality. As the authors note, their mortality was low, so again may not have been able to detect a difference. So, what does this mean. To me it’s a little worrisome because I doubt that the “usual care” represents the true usual care found in EDs/ICUs all over the world, so I am concerned that many docs will use this as a reason to justify not changing their practice, similarly to many I’ve heard say they don’t need to cool anymore after the TTM trial. Human nature for some I guess. Bottom line? You don’t have to follow EGDT if you’re conscientious and reassessing your patient frequently and have done all the other good things (abx, source control, etc). I think that’s really important because giving blood (see my post about S1P) to those with hb > 70 and giving dobutamine to patients with potentially normal or hyper dynamic LVs never made physiological sense to me, and the problem with a multi intervention study such as EGDT is that you can’t tease out the good from the bad or the neutral. Again, studies such as EGDT are pivotal in changing practice and raising awareness, so this is not a knock against a necessary study, just to highlight the point that each study is a step along the way of refining our resuscitation, and the important thing is to move on. In fact, the reason that this is a negative study is probably due to the improvement in “usual care” that EGDT brought along. Conclusion: No new ground broken, but these studies do make me feel more confident and validated in continuing to not do certain things (strict EGDT) and doing others (albumin and earlier use of vasopressors). Ok, so once you’ve determined you should drain a pleural effusion, your options are to insert a small catheter (CVC, pigtail, generally 8.5 to 14F) or a traditional chest tube. 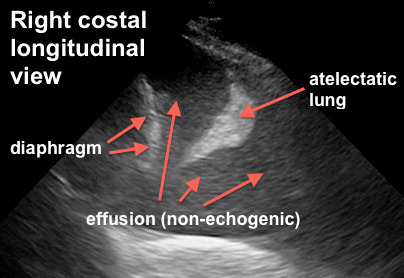 CVCs/pigtails should only be inserted when (a) you have ultrasound guidance and (b) the effusion appears to be free flowing and without a great deal of echogenic contents. Why? Because to go in with a sharp needle, as the seldinger technique requires, you need to visualize a safe spot by ultrasound, and because if the effusion is complex with septations and blood/pus, it likely needs a large bore chest tube to successfully drain. For the less experienced, a traditional chest tube insertion is done using blunt dissection and exploration with a finger, such that the risk of pneumothorax is minimal (no needle). In terms of the pigtail insertion, choose a spot using ultrasound, generally posterior to the midaxillary line to optimize drainage, then freeze, insert the guide needle then guidewire, then dilator and finally the drainage catheter. Here is a makeshift video showing a pigtail insertion. I will make another one more focused on the technique, as this one is a bit more focused on the ultrasound. We ca see a large effusion with a bit of atelectatic lung, and also confirm the placement of the guidewire and the pigtail catheter. Although in this video I showed live ultrasound guidance, in most cases I prefer to pick the spot, mark the skin, and do the technique blind. It is simply faster that way. However in some cases, especially with small fluid collections, I may choose to use live ultrasound guidance. This is actually a very practical skill to have, as otherwise pigtails are generally inserted by interventional radiology, which implies delays, and more importantly, patient transport and its inherent risks and disadvantages. So for those without experience, I would highly encourage you to seek out an experienced operator and learn this technique. Disclaimer: this description and video is for the sole intent of sharing medical knowledge and does not replace formal training. Do not try this without adequate training and/or supervision. …and also because I had my sick toddler napping on me for two hours and typing was not an option. Part 3 with the vid coming in the next couple days, though, apologize for the delay! 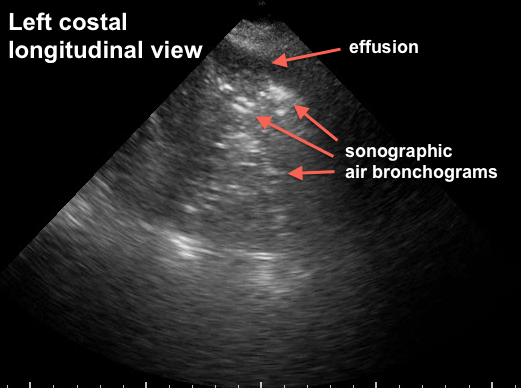 So once your routine cardiopulmonary bedside ultrasound examination has revealed the presence of a significant pleural effusion, should you drain it? 1. underlying global respiratory function – eg how much reserve you have. With healthy lungs, a young adult can usually tolerate complete atelectasis of one lung or even more, which would take 2-3 liters of effusion at least. However, the more compromised gas exchange is, the less atelectasis can be tolerated. This also encompasses the level of required ventilatory support, including the level of PEEP. Basically, the worse your lungs are, the more significant the effusion becomes. 2. thoracic compliance – which combines chest wall and abdominal pressure, since the diaphragm is thin and easily displaced. The greater the compliance, the less atelectasis will occur as the diaphragm and chest wall will shift to accommodate some of the fluid. This is very important especially in surgical patients (or anyone with a tense abdomen). …so there is no number. Of course, if you take it to the extremes, I think everyone would agree that if you have 200ml, it’s probably not worth doing, and if you have 2,000ml, it is. But in the grey zone of, say 500-1,000 ml, you have to make a call given the patient in front of you. Now what does the literature say? First of all, there is no large study looking at the impact of effusions in generally ill patients (ED/ICU). There are some small, specific studies showing worse prognosis in some pathologies (eg Legionella pneumonia) but nothing that can really be extrapolated to general ED/ICU patients. What about in ARDS? Talmor et al, (Surgery 1998, v 123) showed benefit in survival in a small study of ARDS patients. I think the best overall study was Vignon et al (CCM 2005, v 33) who demonstrated that bedside ultrasound was much more sensitive in diagnosing pleural effusion (CXRs read as normal had as much as 1,000 ml effusions, as well as diagnoses of effusions which were actually consolidations ), but also that it was quite accurate in quantifying (inter-pleural distance >45-50mm at the base correlates with effusions >800 ml). Usta et al (Interactive CV and thor surg, 2010 v 10) had similar results in spontaneously breathing post op patients with 45 mm (interpleural distance between diaphragm and base of lung) corresponding to about 700ml, although their range was quite wide, and they were using a somewhat impractical sitting position. They actually came up with a formula (16xdistance in mm) to estimate effusion volume. Sikora et al (ISRN Emergency Medicine 2012) did a good review on the whole thing as well. My empiric observations: I must have put in at least a thousand pigtails or (back in the day) CVCs in pleural effusions over the last 14 years, and my therapeutic goal has always been to drain effusions at least 750 to 1,000 mls. I have drained 350-500 ml in patients in severe respiratory failure a few times, some with apparent benefit, others without. I don’t recall regretting putting one in, but I do regret a few cases of not draining, only to have recurrent respiratory failure post-extubation. Grossly, I would say 750-1,000 or more in a patient with respiratory failure warrants drainage, but 1,000 mls in a CHF patient on nasal prongs can wait for the outcome of diuretic therapy. Of course we are talking about therapeutic and not diagnostic drainage. Under ultrasound guidance with an experienced operator, pneumothoraces should be exceedingly rare. Bottom Line: start by examining your patient, physically and by bedside ultrasound. Understand his degree of respiratory failure and estimate the size of the effusion and the compliance of his chest. Then you have to make the call (that’s why we’re MDs) as to whether this particular amount of pleural effusion in this particular patient is worth draining. Next week: how to do it video! Great post Phillippe and I fully agree that a global assessment is necessary before draining an effusion. With ultrasound we’ve become really good at identifying effusions, but need to understand physiology and especially chest wall/abdominal compliance to understand the physiological implications of drainage vs conservative management.